Czechoslovakia was also know as the Independent Czechoslovak State. It was the result of a breakaway from the Austro-Hungarian Empire. During this period the Czech-speaking areas of Bohemia and Moravia were under Austrian rule. And Slovakia was part of Greater Hungary. Then in October 1918, at the end of World War I, Czechoslovakia became a country. 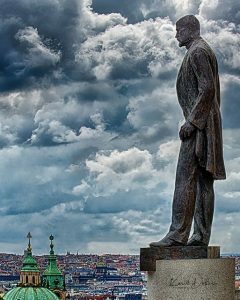 In spite of such a short history, many of the tragic events that befell Central and Eastern Europe during the 1900’s also fell upon the Czech Republic. They struggled against both Fascism and Communism. Czechs celebrate their independence on October 28th which is a national holiday. It’s a much-welcomed day off from school and work. Members of the government lay flowers on the grave of President Masaryk. Then the President gives out awards to people that have contributed to civic life. With the 100th anniversary of the Independent Czechoslovak State coming up in 2 years, plans are underway to celebrate with a massive military parade. The exact plans are secret. But if the 90th anniversary was anything to look back on for inspiration, then visitors can expect hundreds of troops, planes, tanks and other military vehicles passing through the city center.